Director: Michael Mann. Cast: Colin Farrell, Jamie Foxx, Gong Li, Naomie Harris, John Ortiz, Luis Tosar, Elizabeth Rodriguez, Ciarán Hinds, Barry Shabaka Henley, Eddie Marsan, John Hawkes, Ana Cristina De Oliveira, Isaach de Bankolé. 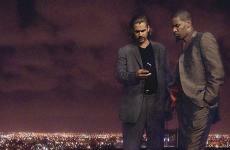 Screenplay: Michael Mann (based on the television series created by Anthony Yerkovich). "This one has too many parts, too many unknowns," warns an essentially nameless police officer played by Elizabeth Rodriguez in Michael Mann's Miami Vice. Rodriguez's character gets a lot of silent screen time and one taut, terrific line of Clint Eastwood dialogue before she plants some automatic bullets right into the medulla oblongata of a white-supremacist, arms-dealing, drug-running kidnapper in a Florida trailer park. Other than that, though, she's just one of many bits of human and narrative clutter in Miami Vice. Like most of the supporting cast, Rodriguez stands around a lot with her arms crossed, her face registering both skepticism and narcissism while Detective Sonny Crockett (Colin Farrell) and Detective Ricardo Tubbs (Jamie Foxx) batter about a lot of "intel" and "counter-intel" and devise circuitous, highly abbreviated, and frowny-faced ways ofwell, basically of getting to the bottom of Things. If I remember correctly, Rodriguez lets fly with this morsel of doubt just as Foxx's Tubbs has instructed FBI Agent Fujima (Ciarán Hinds) to leak five different itineraries for an undercover heroin shipment to the DEA, the FBI, the CIA, and a bunch of other impressive acronyms, any of whom could be responsible for the security compromises that keep getting Crockett and Tubbs in trouble, their colleagues slain, their girlfriends abducted. I held on tight to the basic gist of Miami Vice's plot, even as the swarm of red herrings, distractions, and reversals made it impossible to keep up with the specifics of several scenes. Indeed, too many parts, too many unknowns: Miami Vice is a crowded, amorphous affair, a little bit Lady in the Water insofar as it keeps spinning the wheels and setting the stage for a narrative that never lifts off, a little bit Pirates of the Caribbean: Dead Man's Chest in the grinding length and joylessness of its forward march, but also very much a Michael Mann movie, meaning that the screen still beats with bold visual ideas, reframed archetypes of masculinity and criminality, ardent and costly duels between love and work. It's the best bad movie of the year so far, or perhaps the worst interesting movie of the year, and certainly the most esoterically constructed blockbuster that ever donned a $150-million price tag. It's strange that Miami Vice's failure to entertain, which sometimes feels like an outright refusal to entertain, springs out of an opening sequence that pulses with the opposite promise. The first shot finds a silhouetted woman dancing sensually before a flood of fluorescent lights, underlined by the unlikely but immaculately produced hip-hop-rock-electronica of Jay-Z and Linkin Park's "Numb/Encore." As the sequence widens out to a whole palladium of dancers, their sexual and almost intimidating movements orchestrated perfectly with the music and the film editing, the room and its nervous energy reminiscent of the club where Mann's Collateral staged a centerpiece shoot-out, Miami Vice feels like exactly the balm that this summer has needed: the grainy, prowling photography and the self-serious mug of Colin Farrell let us know that this won't be anyone's carefree thrill ride, but the visceral pull of these opening moments is quite strong, and there is enormous, immediate pleasure in being seduced by a high-octane filmmaker with a highly trained, unabashedly carnal, and propulsive gift for colors, angles, rhythms, sound elements, camera movements, and fully realized locations. Casting is a Mann specialty, and even before anything has "happened," the nightclub keeps yielding unexpected actors united by their instant charisma: Isaach de Bankolé striding around with a passel of brightly, tightly dressed women for sale, Two Drifters' Ana Cristina De Oliveira as a ravishing and tough-looking barmaid. There is more crackle in these opening moments than in most of the summer's big crowd-pleasers put together, even the adequate ones like Mission: Impossible 3 and Poseidon. Then, suddenly, we exit the club so that Crockett and Tubbs can take a phone call on the roof. The summer lightning behind them is almost redundant given the heavy charge that Mann has generated downstairs, but literally within the moment, you can tell that Miami Vice has blown a fuse. Farrell and Foxx hang all the way at the right edge of the frame while Me and You and Everyone We Know's John Hawkes spouts a jittery and cryptic farewell over the phone line: it's the kind of cinematography that asks you to notice the shot, maybe even to praise it, but its formalism feels forced and hollow, and the staticky, gristly texture of the violet sky in Dion Beebe's DV photography throws a cold damper on our mounting interest. It's a frankly unappealing image, soon to expand into a frankly unappealing scene, and given the slinky pop enticements that have preceded it, the precipitous change in attitude can only be taken as intentional. This isn't a subtle switch in atmosphere, cued to a discrete narrative turn. This is a total change in game-plan. Two certainties emerge, and both are borne out by the ensuing two hours: the plot will fractalize itself into a complex, inscrutable web of factions, technospeak, and double-crosses, and the movie will both keep and set the pace with a jittery, unpredictable calico of tones, textures, lenses, palettes, and exposure levels. As the screenplay chases and finally gobbles its own tail, the mise-en-scène will expose that script as merely a necessary platform for the film's heady, multimediated take on 21st-century crime, portrayed here as part and parcel of 21st-century life. I don't think that Mann and Beebeobviously the dynamic duo behind this movie, much more so than Crockett and Tubbsdeliberately intend to alienate their audience, though I found Miami Vice to be a deeply alienating film, both in a Brechtian way and in a give-me-back-my-money way. Clearly, their hearts are in what they're doing, but their hearts are lodged way, way up in their heads, flexing the latest technologies at their disposal, contemplating the possible futures of the action blockbuster, dismantling all that was cosmetic and era-specific about Miami Vice as a TV show, and rooting out new audiovisual paradigms that better correspond to our entirely new world of sophisticated cartels and polyglot globalism. The set must have been terrifically exciting: all of this intellectual foment, linking cameras to epochs to characters to politics to storyboards, might well have been exhilarating for the filmmakers, and you hardly wish to begrudge a "name" director who sees a job like this as an opportunity for novelty, not just a jaunt to the ATM. Unfortunately, for all the activity and discussion that you can imagine behind the set of Miami Vice, the film itself feels impacted, much too fussed over and yet insufficiently cared for. It isn't just a question of expectations being disappointed. Sure, audiences might walk in expecting a joyride, and instead we find an illustrated lecture on the dialectic between density and diffusion: the world of Miami Vice is a small world after all, but it's unnervingly full of people we don't know doing things we don't understand, spread out over listless weeks and then compressed into moments of heavy ballistic action that still feel a bit compulsory, even melancholy, despite the savvy framings and the admirable formal ambition. All of this would be tolerable, even involving, if so much of it didn't feel like a flimsy excuse for something else: changes in setting as an excuse to shoot sleek, expensive vehicles; international networks of danger as an excuse to flaunt exotic locales; a well-written but oddly staged summit with the drug-runner played by John Ortiz as an excuse for the sidelong introduction of the criminal impresaria played by Gong Li; the impresaria played by Gong Li as an excuse to cast Gong Li; the title Miami Vice an excuse to make a cops-n-thugs B-movie of an utterly different genus; the whole movie an elaborate yet slender excuse for its own mannered, expensive, adventurous making. I know I'm guilty of trotting out the same glorified examples and also the same scapegoats over and over, but to reiterate a point, a film like Paul Greengrass' The Bourne Supremacy feels just as alert as Miami Vice is to the post-millennial vanguards in espionage and transcontinental crime, but Greengrass' vision still arrives on screen as an integrated vision: a jewel-cut circuitry of complex ideas that is nonetheless conveyed by graspable characters emanating lucid emotions within clear, traceable circumstances. Alternately, a film like Olivier Assayas' demonlover opts away from an emphasis on psychology and even torques its own narrative, much like Miami Vice does, but it braces together strong, succinct impressions of its characters as they discover how vast, debased, and media-saturated the world has become. Miami Vice doesn't cohere in human or narrative terms like Bourne did, and the dizzying aesthetic doesn't rhyme well enough with the characters' own experience of the world, as it does in demonlover. Crockett and Tubbs don't look nearly as helpless and overwhelmed by the proceedings as Farrell and Foxx do. They keep trying to act the scenes, paralyzed into blank male-model visages by how little the script is furnishing them, while the surrounding movie makes clear that it isn't any more interested in them than Barry Lyndon was in Ryan O'Neal. The only other performer that Miami Vice really lingers on is Gong Li, who's stuck with an even vaguer and less playable thicket of character traits and motivations, helped not at all by the actress' phonetic discomfort with the language.